This works amazingly well!! 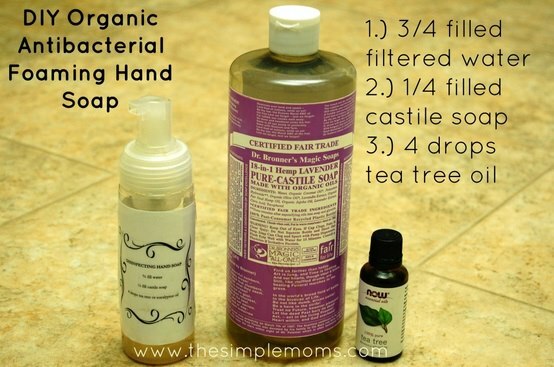 You can use any Dr. Bronner’s liquid castile soap, I prefer the unscented baby-mild as I have sensitive hands 🙂 I have a foaming hand soap in each bathroom and my kitchen and it’s very budget friendly!! Q: What is filtered water? Q: What did you use for the pump? A: Unfortunately I have yet to find an empty bottle/pump to use. I just used old ones from around my house that I had already used up. I would say the best I can offer until I can find a good place (that is not expensive) to buy from, would be to buy ones from store, dump the “stuff” out and clean well. I would note to double check they say BPA free on the bottoms of them (as I made sure mine did).